Cleaning your brush is very important between each client. Any residual product can change the way the brush works. Remember to use a dedicated brush for each type of monomer, and clean each brushes thoroughly with Brush Cleaner between clients. Overtime, as you work with your brushes, the plastic can melt and warp and can ruin your brush. Here’s a tip for keeping your brush looking like new! Before using your new NSI Royal Precision Brush for the first time, remove the silver vented cap. While holding the brush on the silver Ferrule end, apply a thin coat of Glaze ‘n Go or Glaze ‘n Go LED onto the handle, making sure to start where the plastic meets the silver ferrule. 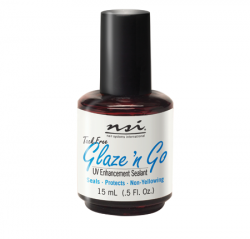 After Glaze ‘n Go is applied, hold the brush into your UV lamp for 2 minutes. 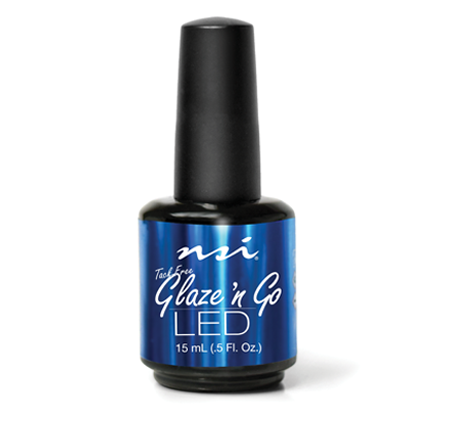 With Glaze ‘n Go LED cure for 60 Seconds in a full hand LED lamp. This “trick” eliminates the sticky residue that eventually forms on the brush handle, keeping the NSI logo intact and your brush handle shiny and clean! If your brush does get messy, simply wipe the handle with either Cleanse or Acetone. Your NSI Royal Precision Brush will always look new! Proper brush storage is just as important as cleaning the brush! Here’s some tips for properly storing your brush! Store brush wrapped in a paper towel and lay flat in a drawer away from airborne dust. Storing brushes upright in a cup or container will allow inert monomer to drain down into the ferrule. When brush is positioned downward for use, the inert material will drain into the brush hairs and contaminate the fresh monomer and the brush. Storing brushes upside down in the spring of a lamp will act like a dust magnet and will attract acrylic dust to the brush hairs.